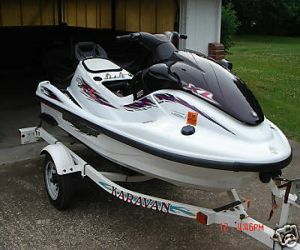 The 1999 Yamaha Waverunner XL 1200 is a great jetski. The engine has 155 horsepower and only 80 hours on it. It can reach a top speed of 58 MPH. There is more than enough room for 3 people on this jetski. All of the gauges are digital they are gas,oil,MPH,trip and RPM. It can be programmed with a security code to ensure no one is able to steal this Yamaha Waverunner. This Yamaha comes equipped with Quick Trim Adjustment system which means you can adjust the nose of the jetski for rough or smooth water conditions. The Yamaha Waverunner is mostly white with a few purple accents. The seat is black leather and the hood is a also a slick black. The handles are placed above the hood. There is a small storage space in the rear of the jetski. This jetski has been stored in a garage at all time so there is minimal weather damage.